Melt the margarine in the microwave and mix together with the eggs / egg substitute and the cane sugar. Peel the bananas and squish them with a fork (or your hands) to a mash. Add to the mixture. Sieve the flour once and mix with the starch and natron / baking soda. Add the flour-starch mix and the vinegar to the rest of the dough and stir it all together. Cut the date into small pieces and along with the walnuts fold it in the dough. Add the dough to a greased loaf pan (25 - 30cm). Half a banana lengthways and slightly press them on the dough. 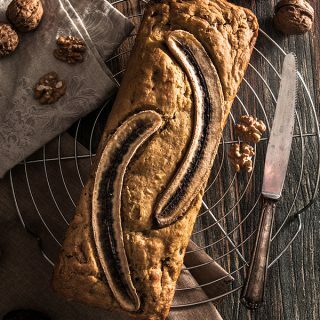 Bake the banana bread for 45-50 Minutes. With a spit of wood test if the dough is already good. Take the loaf pan out of the oven and let it cool for a while before dropping it out of the pan.